Ireland is without doubt one of the most gorgeous places on this amazing earth. Experiencing the scenic and cultural delights of the Emerald Isle is an opportunity that many would jump at, but deciding where to start can sometimes be tricky with so many stunning locations to choose from. That’s why the team at Motorhome Republic created this guide to the ultimate Ireland road trip. A campervan hire in Ireland will grant you an immense amount of freedom to explore this verdant country, allowing you to luxuriate in its unique beauty. Ireland’s east coast is the ideal place to start your trip. Not only is Dublin a supremely convenient place to kick off your journey if you’re flying in from overseas, but beginning your Ireland road trip here will also allow you to get a taste for Irish city life before heading out into its famed countryside. With the Irish Sea at your left and a day of touring picturesque villages ahead of you, this leg provides visitors with a stunning first impression of the Emerald Isle. Originally founded as a Viking settlement, this is a place that has dominated Irish history for more than 800 years and today is a thriving global city, known for its sterling literary tradition, underground arts scene, and vibrant nightlife. It’s also one of the most youthful cities in Europe, with around half of the population aged under 25. This gives Dublin a fresh, exciting vibe that is palpable as soon as you begin to explore. Having arrived in such an amazing city it would be a terrible waste to leave straight away - so before you pick up your Dublin motorhome rental, take the opportunity discover a few of the things that has made it one of the region’s top travel destinations. There’s certainly far more to Dublin than Guinness, but there’s no denying that many visitors will be seeking a taste of the black stuff before they leave the city. To discover the home of this distinctive brew, you’ll need to head to the Guinness Storehouse at St. James’s Gate Brewery, the place where Guinness has been produced since 1759 - and considering old Arthur Guinness signed a lease for 9,000 years, it seems likely to be around for a wee while longer. 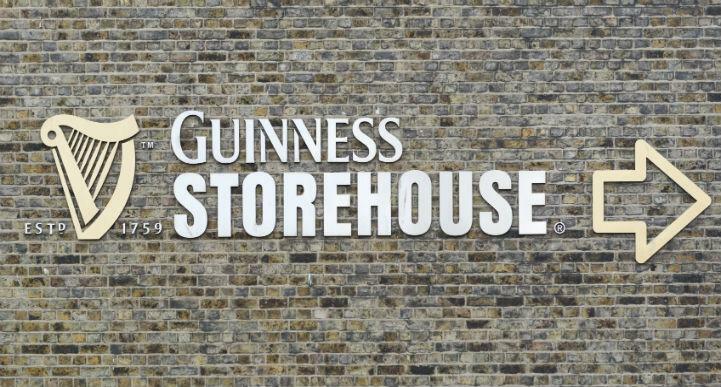 The Storehouse itself once served as the fermentation plant for the brewery but has now been transformed into a seven-storey visitor centre which presents fans of the black brew with the full Guinness experience. Booking ahead for the self-guided tour isn’t required but it will get you a 10% discount and allow you to skip the queue. If you’re after a Dublin Guinness experience that’s a little less touristy, try Kehoe’s on South Anne Street in the Temple Bar area. There’s no tour here, just plenty of old-style character and pints of creamy Guinness. Although it’s a bit cliche to visit a museum when arriving in a new city, you should make an exception for the National Museum of Ireland. The Archaeology division on Kildare Street is particularly worth a visit. There’s no better way to get an appreciation for Irish history - medieval Celtic craftsmanship like the Ardagh Chalice and the Tara Brooch, prehistoric gold artefacts, and even strikingly well-preserved bog bodies. It’s not only Irish history on display either - Viking history has a place of course and visitors can even see treasures from ancient Egypt. For some, there’s no better way to get a taste for a new place than with a bit of retail therapy. If that sounds like you then Dublin has plenty of spots only too happy to accommodate. Grafton Street is the place to go if you have expensive taste or are keen to do some high-class window shopping. This is among the most expensive main shopping streets in the world, however it’s not exclusively for the rich - Grafton is also known for its buskers. Musicians, mime artists and poets perform for shoppers making this an interesting attraction even if you’re not planning on spending up large. Those who are interested in something a little more down to earth should head to Moore Street instead. Located just off of Henry Street, Dublin’s other major shopping area, the Moore Street open air market is the city’s oldest food market. Moore Street also has immense historical significance as this was where Irish Volunteers (among them, five of the seven signatories of the Irish Proclamation of Independence) surrendered to British forces at the end of the Easter Rising in 1916. Don’t leave Dublin without dropping by Saint Patrick’s Cathedral. Constructed between the years 1220 and 1260, this is one of the few buildings from medieval Dublin left standing. Saint Patrick’s is the largest cathedral in Ireland and has had a fascinating history over the hundreds of years it has graced the city. To delve into the story of Saint Patrick’s Cathedral you can join one of the guided tours which take place periodically throughout the day, or you can download a free App if you prefer to explore at your own pace. If there’s anything more iconically Irish than the country’s green rolling hills, it has to be whiskey. So before you take on driving duties, do yourself the favour of sampling a dram of the amber liquid at the Irish Whiskey Museum. Even if whiskey isn’t your tipple, the museum tour is both entertaining and informative, outlining the rise and fall (and rise again) of Irish whiskey and the impact it’s had on the history of this country. You may find it difficult to tear yourself away from Dublin, but don’t forget that you have some of the most beautiful views in the world ahead of you. It won’t take long after you jump in your Dublin campervan rental and leave the city behind you to discover why so many people praise the scenic qualities of the Irish countryside. County Wicklow, also known as the Garden of Ireland, is a stunning introduction to Ireland’s rural delights. Making the half-hour detour westward to Glendalough is nigh compulsory. This dramatic glacial valley shelters two lakes, an abundance of wildlife and an early medieval monastic settlement that was founded in the 6th century. 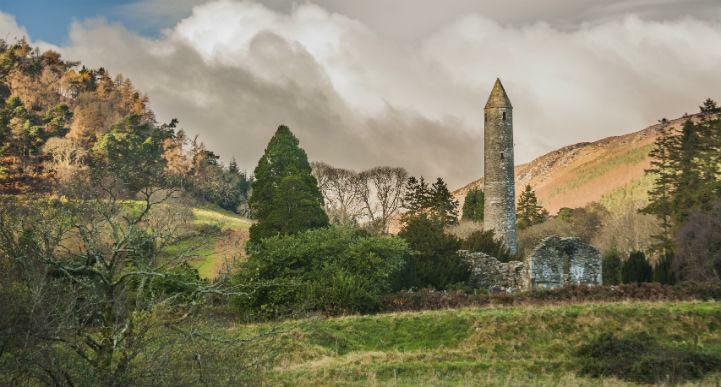 Glendalough isn’t quite on your way south, but it’s well worth taking the time to go a little out of your way. Heading south again, never straying more than a handful of kilometres from the coast, you’ll come across the town of Wexford. For hundreds of years Wexford was an independent Viking city-state which fiercely resisted Irish conquest before a peaceful settlement was eventually reached. 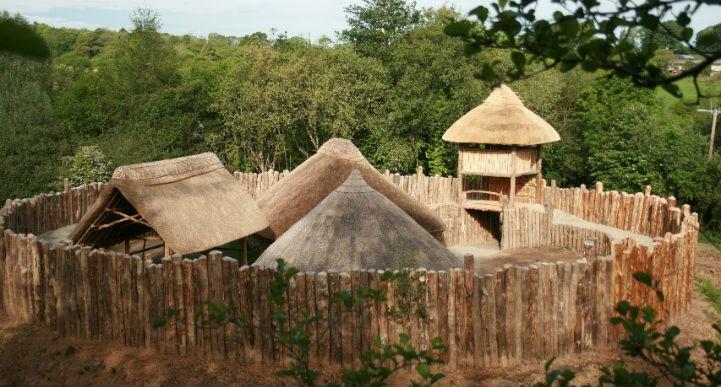 10 minutes to the north of the town at the Irish National Heritage Park in Ferrycarrig, visitors can see recreations of Viking houses alongside Irish crannogs and Norman forts. Movie buffs may also be interested to know that the shocking opening scenes of Saving Private Ryan were shot at Wexford’s Curracloe Beach. If you turn left just before crossing the river into County Kilkenny you’ll come to Dunganstown where you can find the Kennedy Homestead, the birthplace of President John F. Kennedy’s great-grandfather Patrick Kennedy. Today the Kennedy Homestead is a cultural museum dedicated to both the Kennedys who went across the Atlantic and those who stayed behind - amazingly, it is still farmed to this day by the descendants of Patrick Kennedy. From the Kennedy Homestead, you’ll be little more than half an hour away from Waterford, your final stop for the day. Having been introduced to Ireland’s countryside, it’s time to discover some of the country’s most famous locations as you drive your Ireland campervan rental through the Emerald Isle’s southern counties. Visit the launching point for history’s most famous ship, gain yourself the gift of the gab and explore the biggest native forest left in Ireland - these are just a few the highlights ahead of you! Some will be keen to drive straight on from Waterford and be on their way considering the exciting things in store to the west. However if you do decide to take a look around the city before hopping in your motorhome rental and driving onward, Waterford has a number of spots worth checking out. The Cathedral of the Most Holy Trinity is a relatively modern cathedral by European standards, having been designed in 1793, but in spite of this it’s still the oldest remaining Roman Catholic cathedral in Ireland. Quite aside from its history, the sheer beauty of this edifice is what makes it really worth a visit. The stained glass windows, created in the Munich style by German craftsmen, are truly impressive works of art and the Waterford Crystal chandeliers (a gift from the renowned local crystal manufacturers) add even more glory to a space that has evidently been created with much love, skill and reverence. 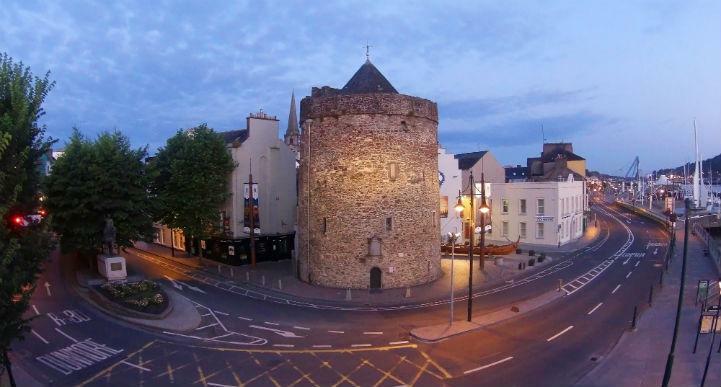 To look back a little further in time, you’ll want to pay a visit to the Waterford Museum of Treasures, a trio of museums including a Viking Museum at Reginald’s Tower and the Medieval Museum which encompasses two actual medieval chambers and features the only known piece of clothing worn by the infamous Henry VIII, a cloth cap. You may choose to drive directly from Waterford to Cork, but if you want explore the history of the world’s most famous ship, then take a short detour toward the seaport town of Cobh. The RMS Titanic departed from Cork Harbour on the 11th of April 1912 for her maiden voyage across the Atlantic, and today Cobh’s ‘Titanic Experience’ allows visitors to get an insight into life at the time that fateful voyage. Although we have this leg of the journey ending up in County Kerry, part of the charm of travelling in a campervan is the fact that you have a lot of flexibility when it comes to travel plans, so it’s easy to stop here for the day and explore the city if you feel the attractions of Cork calling to you. Cork certainly has plenty to hold your attention and could merit a visit of a couple days at least if you have the time and are so inclined. One of the first places to discover is without a doubt the slightly oddly-named English Market. This covered food market is the oldest of its kind in Europe, and it’s the best place to go for delicious artisan foods. The English Market is most famous for its fresh fish and meat, but if you’re feeling a little adventurous you can also find local specialties like buttered eggs, drisheen (a type of gelatinous black pudding) and spiced beef. If you find yourself craving a little culture, the Crawford Art Gallery is the place to go. Dedicated to both history and contemporary visual arts, the gallery has over 2500 works - the pride of which are the Canova Casts, a set of plaster cast masterpieces gifted by the Vatican to the Cork Society of Arts around 200 years ago. The admission price for this prime Cork attraction? Absolutely nothing. 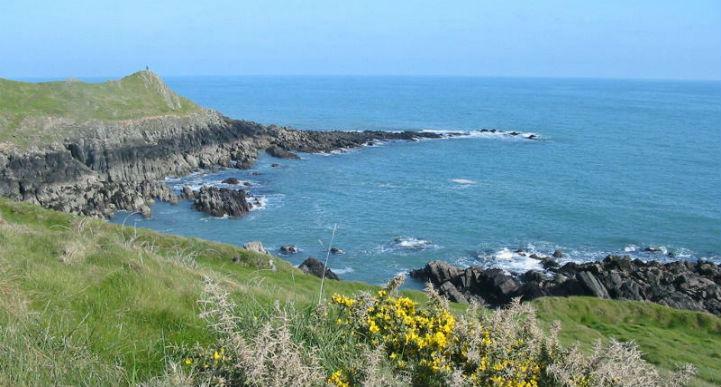 Those looking to stretch their legs and feel the sea breeze in their face can take the scenic Ballycotton Cliff Walk. This is a stunning walk, just make sure to bring along suitable footwear as it can be fairly muddy depending on the weather. You can also choose to take this walk before you arrive in Cork as it starts about 45 minutes east of Cork city centre. Less than an hour and a half after you strike out from Cork you’ll reach the town of Killarney. This could signal the end of your day, after all you’ll certainly want to end up in Killarney to be poised for a trip around the Ring of Kerry. But having come so close to beautiful Killarney National Park, many will want to at least glimpse this very special place. 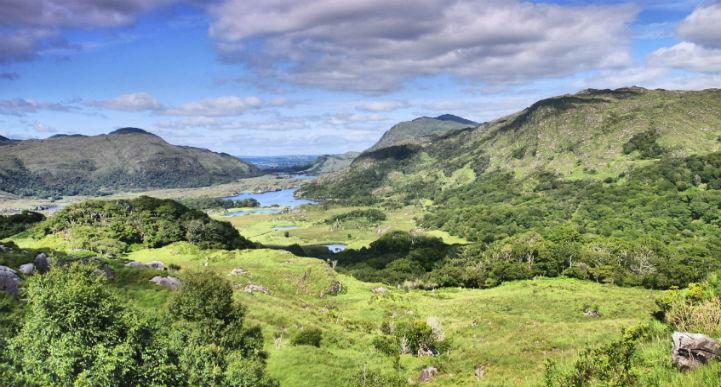 Located directly to the south and west of Killarney town, the national park is characterised by a broad expanse of rugged, mountainous country and deep interlinked lakes. Killarney National Park has Ireland’s most extensive tract of native forest, and is also home to the country’s only native herd of red deer. Less than 20 minutes south of Killarney you can find a visitor centre at Muckross House, a Victorian mansion with a dramatic mountainous backdrop. This is the perfect place to start your exploration of the park, which can be explored by walkers and cyclists alike thanks to a network of surfaced paths. When you’ve had a chance to explore the oak woods and lake shores of this picturesque park, it will be time to head back to Killarney and rest up for your drive around the Kerry Ring. Although the Ring of Kerry, a scenic drive around Iveragh Peninsula, won’t advance your journey around Ireland, returning you in fact to Killarney where you started the day, it’s still worth taking a day to explore the gorgeous coastal landscapes and quaint seaside villages of southwest County Kerry. Make sure to leave early and set aside plenty of time to stop and admire the spectacular views. Although there is some measure of back and forth on the matter of which way to travel the Ring, the official advice from the tourism office is to travel counterclockwise around the Ring to minimise traffic issues. Another advantage to the counterclockwise option is the fact that you won’t be going head to head with tour busses (which exclusively travel counterclockwise) on the narrow, winding roads. If you happen to be travelling during August, make sure to check whether you’ll be passing through the little town of Killorglin during the Puck Fair. A festival which dates back as far as the 17th century, the Puck Fair tradition features the capturing and crowning of a mountain goat as ‘King Puck’. Believed to be one of Ireland’s oldest fairs, it’s worth getting caught up in the festivities if you can time it right. When you reach Glenbeigh, be sure to head out to the nearby pristine golden sand beach of Rossbeigh Strand. On a fine day, there’s no better place to go for a spot of bodysurfing or sunbathing. The village of Glenbeigh itself is often referred to as The Jewel in the Ring of Kerry - nestled in a horseshoe of verdant hills and mountains with two rivers bounding the town on either side, it’s not hard to see why. 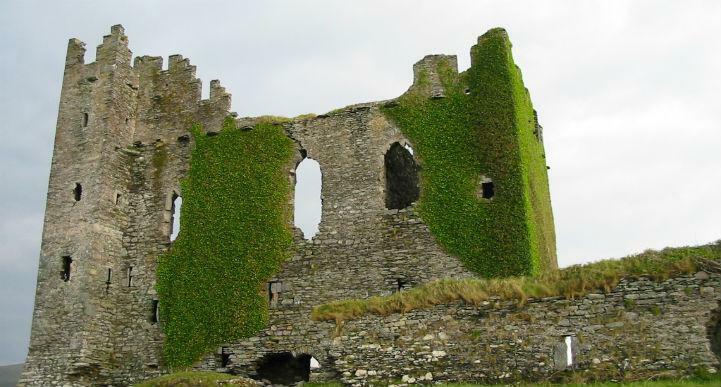 Near Cahirciveen you can find the ruins of Ballycarbery Castle, constructed in the 16th century. Though it’s now a far cry from the imposing fortress that it must once have been, it still has a certain beauty to it, and visitors can explore the grassy first floor of Ballycarbery - the second floor is now inaccessible as the stairs disappeared years ago with the back wall. If you have time for a bit of a side trip, veer off the N70 and make for Portmagee. 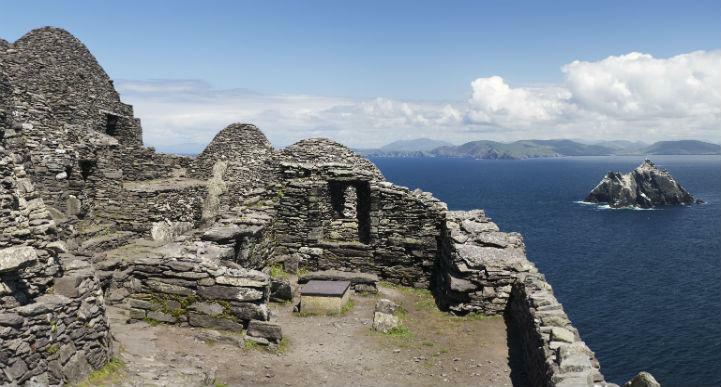 This is where you can catch a boat out to the Skellig Islands. Skellig Michael, the largest of the islands, is a UNESCO World Heritage Site and home to a 6th century monastic settlement. Those who are prepared to make the 670 step hike to the summit of the island will be rewarded with not only with spectacularly expansive views of the Atlantic but also the chance to explore the ancient settlement. If you’d prefer to stay on dry land and continue on your way around the Ring, head on past Waterville and make for Derrynane National Park, near Caherdaniel. Nature trails will bring you across sand dunes to a beautiful beach - and if manage to arrive at low tide you can even reach the diminutive Abbey Island explore the ruins of the 6th century Derrynane Abbey. When you reach Castlecove, just 6 kilometres from Caherdaniel, keep your eye out for a small road that leads off the N70 to Staigue Fort, a partially ruined Iron Age ringfort which appears to have been used as both a fortress, an observatory and a place of worship. Around 45 minutes from Castlecove you’ll come across the seaside resort town of Kenmare. Set at the head of Kenmare Bay, this pretty little town is noted for its food and pubs and is an excellent spot to enjoy an evening meal before heading on back to Killarney once more. This leg will have you striking northward for the first time on your trip, leaving the coast behind for much of the day to drive through Ireland’s lush interior. Tiny towns and open countryside will characterise much of this leg of the journey, although city of Limerick will provide a change of pace for those missing their urban comforts and conveniences. Killarney provides an excellent base for exploring southwestern Ireland but this town is more than just a place to come back to at the end of the day. It is one of the country’s top tourist destinations; it’s worth spending at least little while taking in the sights of Killarney. One quintessential Killarney experience which will allow you to get a first-class view of the town and its surroundings is taking a ride on a jaunting car (horse-drawn cart) operated by a local jarvey (cart driver). Not only will this add a bit of local flavour to your time here, with drivers providing unique insights into the history and landmarks of Killarney, but you’ll also have the chance to venture out of town to places like Ross Castle and Muckross House. Of course, you could drive yourself out to many of these spots but it’s not quite the same as taking a leisurely outing in a horse drawn cart while being regaled with tales of the past. If you’re more of a party person than the type to take horse and cart tours, don’t worry - Killarney has a surprise in store for you. The town has a thriving nightlife, and during the summer months when the population of Killarney swells with tourists, the nightspots are often packed every day of the week. Even during the quieter months you’ll still be able to find plenty of people to party with on the weekends. Once you’re finally ready to leave behind the bucolic delights of Ireland’s southwest, it’s time to begin your journey northward. Less than an hour and a half northeast of Killarney you’ll find a place that has been consistently lauded as one of Ireland’s prettiest destinations: the lovely village of Adare. Located just 20 minutes from Limerick, you’d never guess that you were practically on the doorstep of a large city. 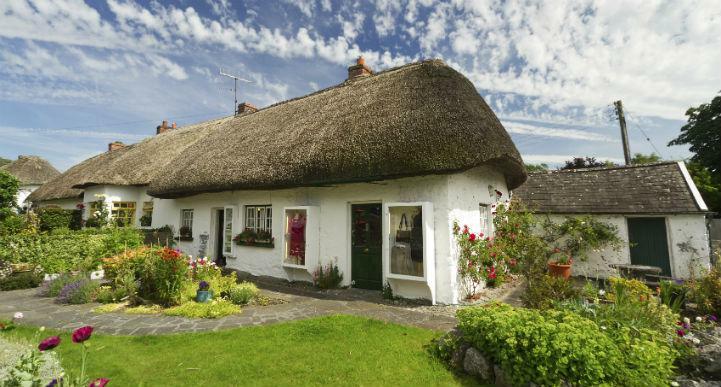 Don’t leave without seeing Adare’s 19th century thatched cottages - originally built by an English landlord for the workers who were constructing Adare Manor. Today the cottages host quaint craft shops and fine restaurants. 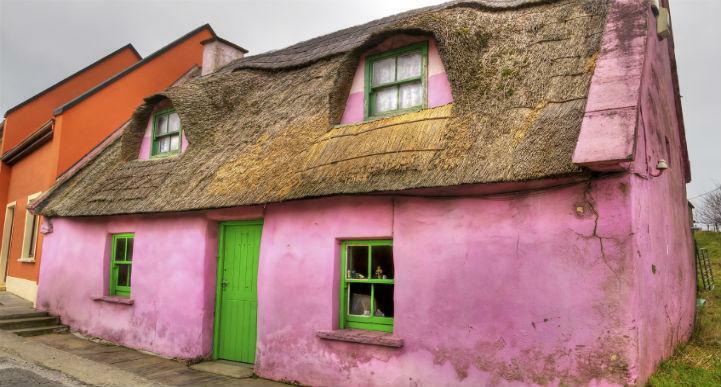 The cottages may be Adare’s most famous feature but they’re certainly not the only scenic attraction in the area. The Celtic Park and Gardens, for example, provide a beautiful setting for relaxation and contemplation and also give visitors an insight into the heritage of ancient celtic Ireland. With displays featuring a lime kiln, a ring fort and a dolmen, among others, a visit to the park is an opportunity for enrichment as well as refreshment. The fourth most populous city on the island of Ireland, Limerick has had an important part to play in Irish history over the centuries, from its place in the heart of the Kingdom of Thomond (at one time famously ruled by Brian Boru) to its role in the resolution of a bloody religious war in the 17th century, right through to the 21st century when Limerick became Ireland’s inaugural National City of Culture. 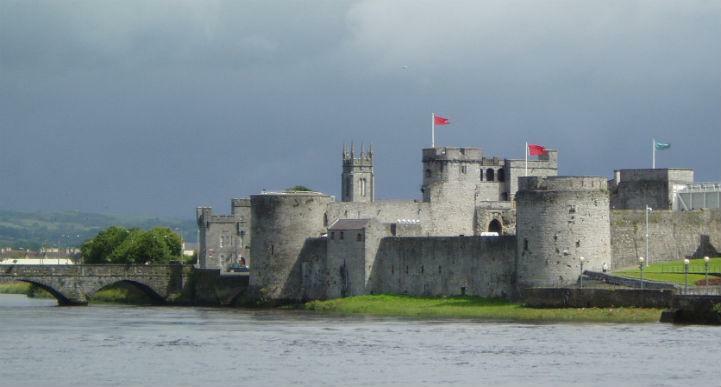 King John’s Castle sits on King’s Island by the River Shannon and is one of Limerick’s most popular attractions. This is one of the best preserved Norman castles in all of Europe and has stood since the year 1200, although there has been a stronghold on the island since the Viking sea-king Thormodr Helgason used the location as a raiding base in the 10th century. Admission to the castle is open all year round, where visitors can delve into the past via ancient architecture and cutting edge technology. Don’t forget to book at least 24 hours ahead for the King John’s Castle Visitor Experience. If you’re spending a Saturday morning in Limerick, make the effort to get up a little earlier and head down to the Milk Market. In spite of its name this market is a fantastic place to grab a bit of brunch and pick up some tasty supplies for the journey north. Both buyers and sellers from all over the region come to the Milk Market, creating an exciting, lively atmosphere which is almost as enticing as the delicious morsels on offer. 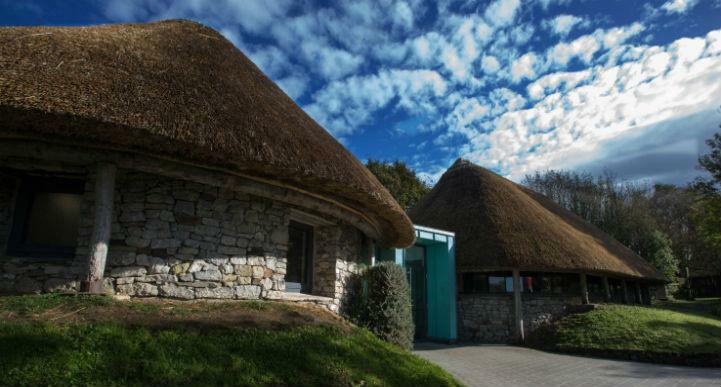 Before you head on your way, consider taking a short journey south to discover the Lough Gur Visitor Centre. Located right at the heart of a landscape packed with archaeological sites from every period in Ireland’s human history, you may have to get our your map or GPS to find the Centre as it’s a little away from the main roads - but that’s part of the charm. Families and history buffs alike will find a Lough Gur a fascinating way to get a glimpse of the many faces of Ireland over the centuries. Having explored Limerick to your heart’s content, it’s time to drive west through County Clare to Atlantic coast and the famed village of Doolin. You’ll want to get an early start when embarking on this leg of your journey as it’s a relatively long journey from Doolin to Londonderry. Although the trip might take a few hours, it certainly won’t be a dull drive. From the youthful energy of Galway City to the megalithic tombs of Carrowmore, this part of your Irish odyssey present you with a smorgasbord of wonders to choose from along the way. Before you head on your way toward Londonderry, strongly consider spending at least a day in Doolin. For those who want to get a true taste of traditional Irish music, this is absolutely essential. Doolin is famed as the traditional music capital of Ireland - those who spend a night in one of the village pubs are almost guaranteed to find themselves privy to a spontaneous musical session. If you’re hunting for something to do during the day, taking a tour of Doolin Cave is a very attractive choice. Even if you’re not normally the type to undertake subterranean journeys, this guided tour is very accessible and showcases some truly amazing geological features. Before you leave the Doolin area, you have to take the 15 minute drive south to see the Cliffs of Moher. Stretching for 8 kilometres along the coast, these spectacular cliffs rise 120 metres above the waves of the Atlantic below. This is one of the most popular tourist destinations in the whole of Ireland, and for good reason. Head to the visitor centre to find out about the history, geology of the cliffs, as well as the plants and animals that call them home, or take a Cliffs of Moher cruise to see these soaring heights from an entirely different angle. 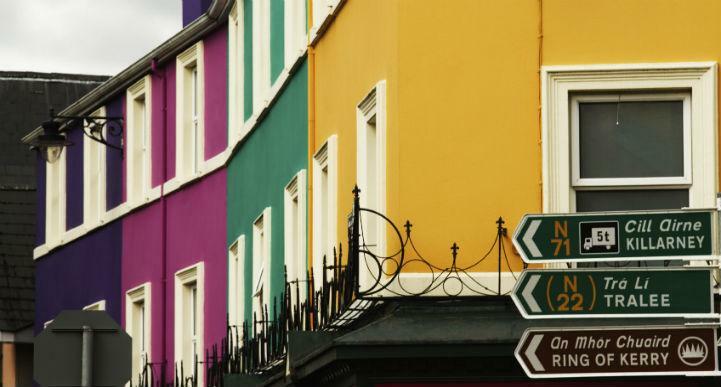 If you have any extra time to spend on your trip, spend it in Galway. 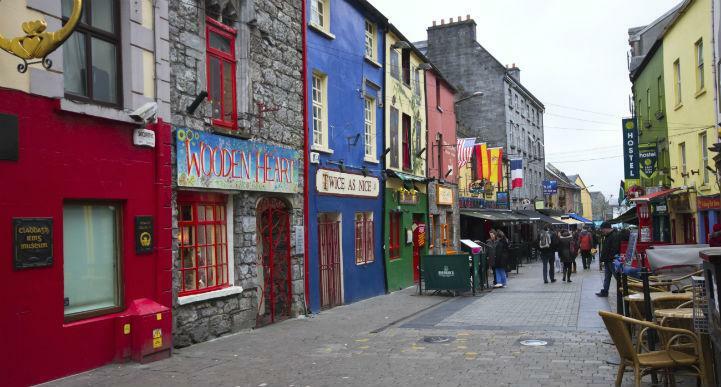 Known as ‘Ireland’s Cultural Heart’, Galway is famed for its vibrant lifestyle and many celebrations and festivals. Do yourself the favour of checking which events are on during the time you’ll be in town and you could find yourself in the midst of an incredible cultural experience. If you’re sticking around for a bit, Quay Street is a fantastic place to spend a night out. Plenty of live music, great pubs, street performers, many different restaurants to choose from and a classic, boutique style atmosphere make this place the natural choice for a casual evening. The Galway Cathedral isn’t ancient like many of Ireland’s other cathedrals, having been constructed in the mid-20th century, but that doesn’t mean you shouldn’t visit while you’re around. This beautiful edifice constructed from local stone and has a calm and reflective atmosphere to it that makes you forget its relative youth and simply bask in the serenity this place provides. It would be easy to spend weeks taking in all that Galway has to offer but eventually you’ll have to drive on - after all, there are plenty of exciting places yet to discover! A little over two hours after you leave Galway you’ll encounter the seaport of Sligo. 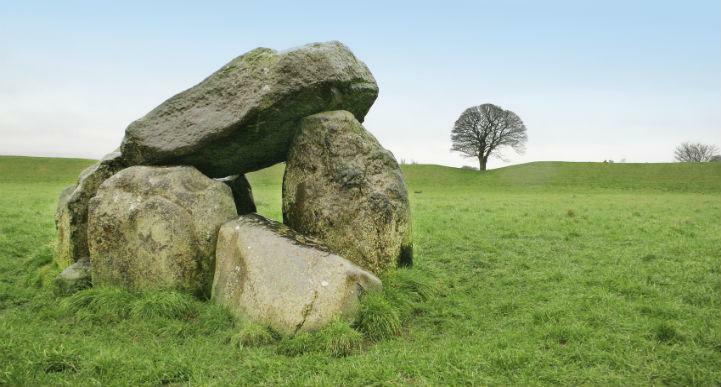 The town and surrounding countryside are very beautiful and make this a popular tourist spot on its own merits, but just a few kilometres to the west of Sligo is something even more amazing: the ancient megalithic cemetery of Carrowmore. While the exact time of construction is a little hazy, it has been estimated that they were erected between 4300 and 3500 BC. Head to the visitor centre, housed in a restored cottage, to see an exhibition about the site before visiting the site itself - just remember to wear shoes that are okay for walking on uneven terrain. On the way out of Sligo those with a literary bent may want to stop at Drumcliff Churchyard where the acclaimed poet William Butler Yeats is buried. From Sligo it’s around a two hour trip north, up and over the border into the United Kingdom and Londonderry. You’ve arrived not only at the last leg of your journey, but also in an entirely different country. Although you haven’t left the Emerald Isle, crossing the River Foyle just before reaching Londonderry marked your departure from the Republic of Ireland and your arrival in Northern Ireland, a part of the United Kingdom. Although it’s a mere 3 and a half hours driving time from Londonderry back to where you started in Dublin, many will choose to break this leg into two days in order to spend more time in the capital of Northern Ireland, Belfast. However you choose to divide up the final stage of your journey, it’s sure to be packed with amazing experiences, given the places you’ll be travelling through. The city of Londonderry, more commonly known as Derry, is an ancient place which has truly come into its own in the 21st century. In fact, Derry has positively flourished in the last couple peaceful decades and emerged as a modern, vibrant and welcoming city. That doesn’t mean that links with its fascinating past have been forgotten. One of the best ways to connect with Derry’s past is by exploring the city’s imposing 17th century stone walls. 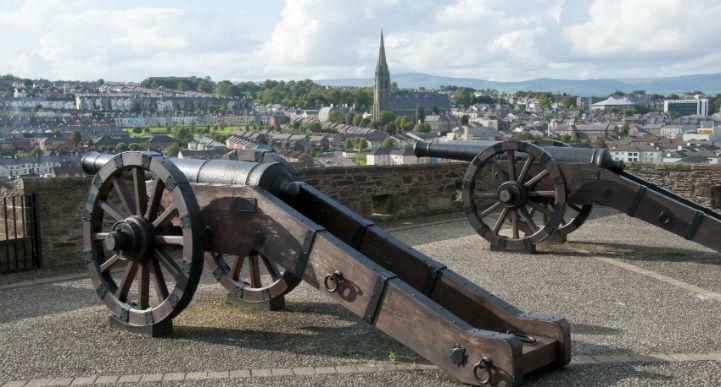 This is the only completely walled city remaining in Ireland, and taking a tour of the walls will introduce visitors to the tumultuous history of Derry. It’s a longish walk around the perimeter of the walls but not a difficult one and the combination of scenic views and intriguing historical insights makes this an essential Derry experience. Housed in an historic tower within the city walls themselves is the Tower Museum, the perfect place to really get a good grasp of where Derry came from and where it’s going. In addition to its excellent exhibition on the history of the city, you can discover the story of the La Trinidad Valencera, a vessel from the infamous Spanish Armada that was shipwrecked off the Irish coast in 1588. The 20th century was not an easy time for this city - the Troubles, a conflict over the political status of Northern Ireland, arguably started in Derry with the Battle of the Bogside in 1969 and the city continued to suffer in the midst of the Troubles for the next few decades. A visit to Free Derry Corner in the Bogside neighbourhood will give you a moving insight into the struggles of those who lived through this period. As well as the historic freestanding wall painted with ‘YOU ARE NOW ENTERING FREE DERRY’, there are a number of murals evoking the chaos, heartbreak and strength of spirit that characterised the time period. Although following the direct route along the A6 and M1 from Londonderry to Belfast would only take about an hour and a half, a campervan road trip is all about freedom and exploration - so why take the most direct route when there are so many amazing things to along Northern Ireland’s coastline? Heading to Bushmills will put you within striking range of several unique attractions. The Old Bushmills Distillery traces its roots back to 1608 when Thomas Phillipps was granted a licence to distill whiskey by King James I, and Old Bushmills became official in 1784. Offering both guided distillery tours and a tasting experience, this is a chance to be part of the oldest whiskey tradition in Ireland. Less than 5 kilometres to the north of Bushmills is the Giant's Causeway. Around 60 million years ago a volcanic eruption formed the distinctive series of interlocking hexagonal stone columns. If mythology is to be believed however, the remarkable landmark is the remnant of a causeway between Ireland and Scotland, built by the giant Fionn mac Cumhaill so he could fight the Scottish giant Benandonner. Regardless of the Causeway’s origins, make sure you take the chance to see this striking place for yourself. Before you leave the area, those with a stomach for heights should head out Ballintoy way to the Carrick-a-Rede Rope Bridge. The bridge connects the small island of Carrickarede to the mainland - fishermen have been constructing bridges out the island for hundreds of years to take advantage of prime salmon fishing spots. Visitors who brave the walk across the swaying bridge, 30 metres above the rocks, will be rewarded with exceptional views of Scotland and Rathlin Island. 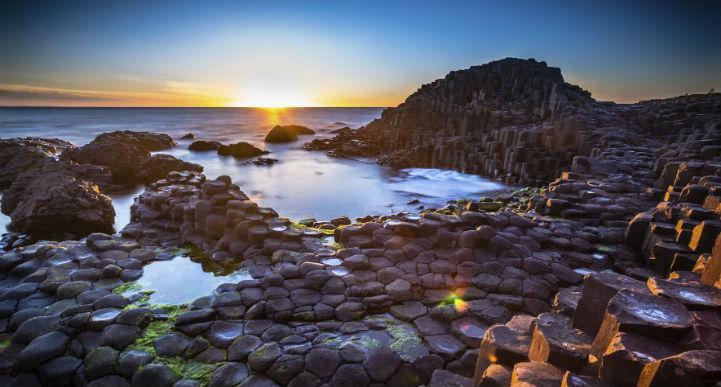 Drive on down Ireland’s northeastern coast to discover a series of picturesque coastal villages, each more lovely than the last, before turning onto the A8 in Larne and heading for Belfast. Although this city was one of those hardest hit by the turmoil and violence during the Troubles, Belfast has bounced back during the long period of relative peace and security that it’s enjoyed since the Good Friday Agreement of 1998. The city has maintained its longtime status as an industrial powerhouse, while also becoming centre for business, arts and education. One of the most popular ways to dive into Belfast’s culture and history will have you temporarily trading your campervan rental for a cab. The Belfast Famous Black Cab Tours have a stellar reputation with travellers and offer a range of different destinations. The upside of a cab tour is that not only will you get to see the most fascinating spots in the city but your driver will provide you with intriguing and entertaining insights into each feature and attraction. Music lovers will find themselves right at home in Belfast. The city has a proud musical heritage which carries through to this day - if you’re sticking around for a day or so, be sure to catch a live gig in the evening. The Black Box and Empire Music Hall are a couple of popular spots to sample some of the local talent, and the Oh Yeah Music Centre is must-visit for music aficionados. Oh Yeah features a performance space, exhibitions and a drop in area - the centre has provided a nurturing environment for young artists since 2008 and is still going strong. 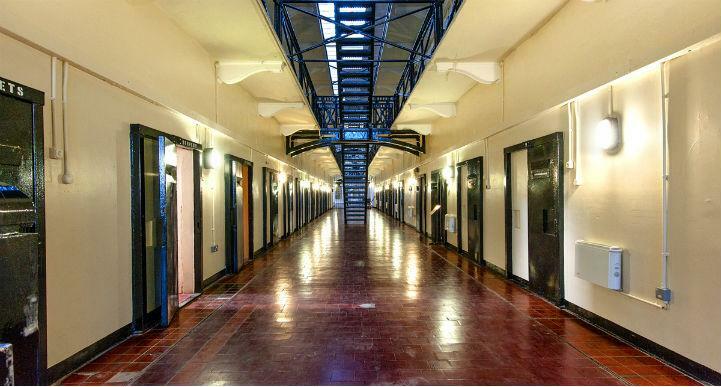 For a fascinating glimpse of the darker side of the city, take a tour of Crumlin Road Gaol. This was a working prison for over 150 years until its closure in 1996 - the very walls are steeped in history. This enticingly eerie experience will leave you not only with a better understanding of Belfast but an indelible impression of what it must have been like for those who lived and died within the walls of the Crumlin Road Gaol. It can get quite chilly inside, so remember to bring warm clothing. Those who would rather forgo tours and simply wander around city at their own pace would do well to visit Cathedral Quarter, set between the Belfast Central Library and the Dunbar Link. This is the perfect spot to grab a bite to eat or enjoy a drink before taking a walk through the beautiful public spaces. Check beforehand to see what’s on here, as you’ll often be able to catch a performance or get caught up in a festival as you wander through. Dublin is only two hours drive south from Belfast, so once you’re finally ready to say goodbye to Northern Ireland and bring your ultimate Ireland road trip to a close, you won’t have far to go.